Your subscription benefits can be shared with teammates as, you add new users to the account. Here's how to invite others to join you in Slidebean and work together. From your Dashboard, click on your name at the top right corner of the screen and then go to "Settings". Here, go to the Team tab. 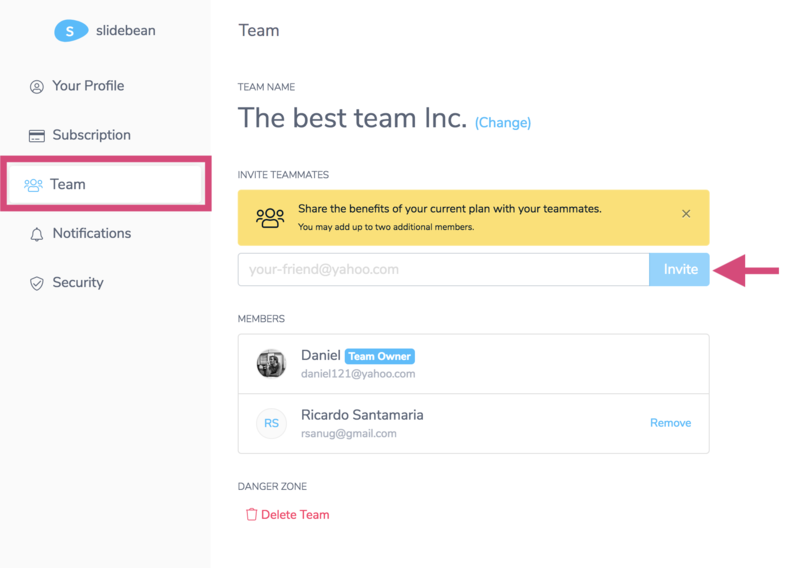 Here you can name your team and invite coworkers by adding their email. An email invitation will be sent and as soon as it is accepted, they'll be added to your team. Team members can be removed from here as well, and you can check what invitations are pending to be accepted. If your teammates have already signed up for Slidebean, make sure to send the invitation to the email address they're using. Otherwise, a second account will be created under the email you use. Keep in mind each additional team seat will generate a $10 fee to your subscription and all these settings can only be managed by the team owner.